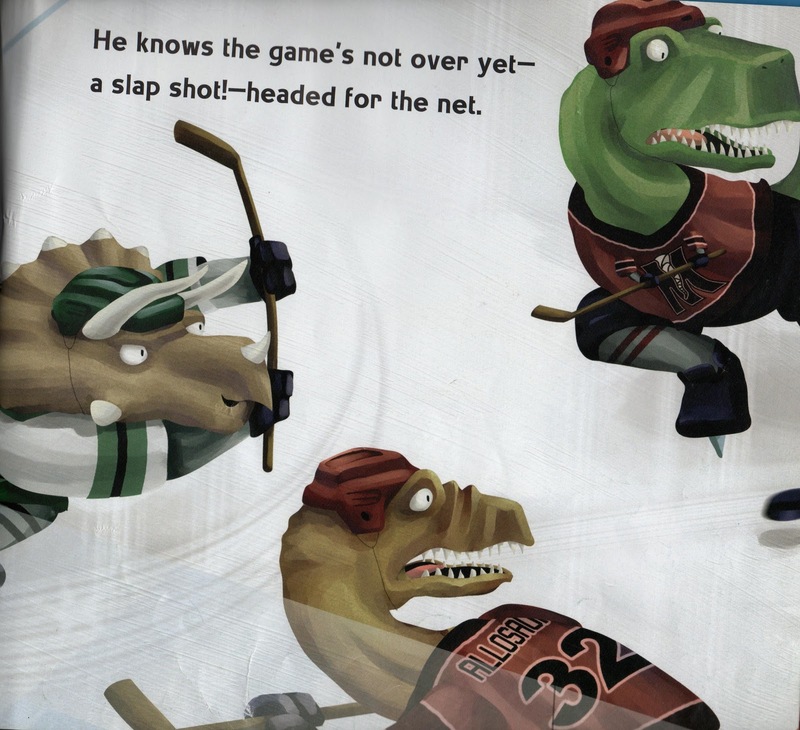 Abby has managed to bring home from the school library one of the most checked-out and sought-after items, the picture and rhyme book, Dino-Hockey--a charmingly illustrated story depicting a game between the Meat-Eaters and the Veggiesaurs. At first, Abby was wondering (nay, demanding to know) why the exclamation point wasn't at the end of the sentence. I started to explain how two dashes can set off a parenthetical subordinate clause (and how that clause could have its own exclamation point), when I realized that those dashes were not in fact doing that. That is, if you removed the words between the dashes, the sentence would collapse like a Toronto Maple Leaf defenseman looking down the barrel of a two-on-one. Still, as a fan of em-dashery, I suggest we keep that first dash and, on Abby's advice, move the exclamation point to the end, giving us: "He knows the game's not over yet--a slap shot headed for the net!" For the record, Triceratops scored on that late slap shot, giving the Veggiesaurs the win for the Cup.